This report is a mundane dive into the energies of influence surrounding the cryptocurrency QTUM. The idea behind this report is to get an idea regarding what type of personality the QTUM network has from an astrological point of view. As always, I provide my summary ahead of the actual research so as to save you time, or at least to set the stage. This is a surprisingly well positioned chart for a cryptocurrency. Jupiter is positioned on the perfect degree for diplomacy and creativity while also providing an overwhelming abundance of energy to the dream of the project. The power in the chart is centered in the house of leadership and it’s partnered with an aggressive ability to communicate their ideas. The communication will be a strength for it will be where the real drive is located. The influences that handle scientific innovation, or technical achievements, are positioned in a place that shows there is a gambling element, or willingness to take risks that will come into play. This risk-taking influence, specifically with technology, is also in a position that will agitate the dream that the project was founded on. The complication comes in how the network participants see the actions of the leaders. There is an aspect of dissidence to how the feminine energy is used by the leaders as if it’s a show rather than legitimately respected and honored. It may lead to the public not understanding some of the decisions or what the intention was behind them. The public is also in a position of extending emotional trust to the headers and they sit in a position of being subject to authority rather than being the authority. I’m looking forward to tracking this network to see what things might come into play for it in the near future. Now, let’s get to the nitty-gritty of it. In order to run an astrology chart for anything, you have to know when it was born. You should be able to determine some reasonable level of confidence with regards to that birth time. When I look at QTUM, I see it as being similar to every other cryptocurrency in that it can be considered ‘alive’ once the network is up and running. The QTUM network’s first processed transaction (block 1) has a timestamp of September 6th, 2017 @ 3:50:29 am UT. The next thing we need to know is where was this first block processed? The location is going to determine what the exact rising sign is, so we want it to be fairly accurate. After doing a little searching online, I’ve discovered that the QTUM Foundation is where the money ended up that was raised from the initial coin offering and that foundation is located in Singapore. Knowing that a number of cryptocurrencies have research groups there, and because the legal system is a little more tolerant there, my guess is that it’s probably pretty likely that the first block was also processed at that location. Today, if you visit the foundation’s website, you’ll see that there are thousands of nodes all over the world that process transactions on this network. But it had to start somewhere. My guess is Singapore. September 6th 2017 @ 11:50:29 am in Singapore. Based on this time, QTUM has the following natal chart. What immediately stands out to me? Because I can, I’ve run off a few reports to give me some feeling as to its base characteristics that this entity would have if it were human. After reading over the house placements in the Cosmo Natal Report, the time of birth seems reasonable in relations to what I know about this cryptocurrency. QTUM has Scorpio rising. This is a very strong-willed, resourceful, brave, yet private type of energy. People that have this influence tend to be passionate, assertive and determined. Scorpio energy can make for a good leader for they are very careful with regards to their emotions. The ruling planet is Pluto which tells us that, at the root of it, this sign is all about transformation and regeneration. Expect there to be secrets that are not disclosed and, that at the heart of it, Scorpio energy dislike dishonesty. Saturn in Sagittarius in the 1st house. This is the planet of restrictions, lessons, rules and regulations, structure, formalities and even civil service. It is a planet that brings an older energy with it as if it’s been around a while and it knows the ropes. It will also bring in a deep-down sense of following the rules or using the rules to their advantage. Being in the sign of Sagittarius, which is generous, idealistic, curious and energetic, we find that the Sagittarius energy will bring a philosophical approach to how things are done and make it so that what is thought of can find its way into manifestation. Being in the 1st house shows that concept of freedom is core to the identity of this project. Retrograde Pluto in Capricorn in the 2nd house. This planet brings up all aspects of the underworld, secrets and transformation. Being retrograde, it may be that this entity will have a hard time integrating what it values into its life. The influences from Capricorn highlight concepts like responsibility, discipline, self-control, yet can also bring out characteristics of being a know-it-all. This energy is the type that tends to also find flaws in things, it’s a critical thinker. The 2nd house is all about what is valued including how it makes money, it is the energy that shapes the inner personality that will be the root of things in life. Looking at this all together, it would seem that this entity will value the secretive things in life and do so in a way that shows self-control. Its as if this entity knows how to make money off the bad elements of life and does that in a way that is managed well. South Node in Aquarius in the 3rd house. This shows that there is comfort in the understanding that in what the entity is capable of and it doesn’t mind being shy or quit for that is time to think and rest in order to move forward with gusto. Pisces Moon in the 4th house. The Moon represents the population, the masses, the general public, public opinion, family, community, the emotion of the participants. The Pisces traits show compassion, intuition, artistic abilities and gentleness. This sign can be overly trusting and fearful, yet there is almost always the energy to help in a selfless way. Being in the 4th house shows that the people will probably intuitively understand and selflessly want to help this entity for they will have a clear understanding of how this fits into the authority structure of the class system and they will probably see this from a family oriented point of view. It could be that QTUM will be seen as a big family or that things will be linked together in a family fashion. There might be elements of a class system here or the public will be in a position to notice this. Retrograde Neptune in Aquarius in the 4th house. Neptune brings in energy that is associated with left-wing political ideas, socialism, communism along with covert plots, fraud, illicit activities, secret plots and bogus companies. It is a water sign which makes it emotional. Being retrograde, the energy will be directed inward which will make one question what is right or wrong or wonder if what is being done is right or wrong. Moon Neptune Conjunction. These two planets are nearly directly at the same spot suggesting that the Neptunian energy will be coloring how the people feel about this project. It’s like there might always be some underlying uncertainty that the people can’t figure out if this is good or bad or doing what it’s supposed to do or not doing it. This is like a strong underlying emotional amplifier that makes the people question the authority in the project in an emotional way. Retrograde Uranus in Aries in the 5th house. Uranus is the planet of scientific discovers and right-wing political ideals. It’s about free-market enterprise, an urge towards individualism, anarchy and technological breakthroughs. The Aries influence will make this fiery, courageous, determined, optimistic and passionate. Being retrograde will make this energy come across as a rebel. Being placed in the 5th house, which is about how someone plays, how they stand out, how they take risks shows that this entity is making a strong hard passionate stand. They are willing to take a risk to support their right-wing political ideas and they are willing to stand strong in their position to support the free-market. This placement may show that they are willing to take risks with technology to advance their cause. The explosive Uranian energy is amplified by the Aries influence which will make this a location to really watch in this chart. Empty 7th house. This may show that the entity is not really concerned with regard to making partnerships or that doesn’t really matter in a good or bad way. Or, if it focuses on this area, it just sees these aspects as normal and non-restricted. Venus in Leo sitting in the 9th House. Venus is the planet of strong feminine and artistic qualities. It’s about the arts, entertainment, sports, resolutions to problems and diplomatic resolutions. This artistic energy is supported by the traits of Leo which is creative, passionate, generous and even humorous. The Leo energy brings out the natural born leaders where they can shine in self-confidence. The 9th house is all about technology, education, diplomacy and power through organization. With Venus here, we might expect that the entity will want to dazzle the world with its feminine attributes and put on a show in order to draw attention to what it’s technically capable of doing and how they educate people. This placement shows that there is understanding in being diplomatic and that education is key to showing off the art of the product. Expect to see them use ‘flashy’ ways to bring people together to see what they have to offer. North Node in Leo in the 9th house. This shows that it’s of primary importance that they teach people about their technology and they know it. They will use the energies of Leo to put on a show that will attract attention in order to accomplish their goals. The node being here suggests that in order for this project to be a success they need to focus there attention here, on teaching people about the technology, in order for it all to come together. Mercury in Leo in the 10th house. Mercury is all about the message and messenger. It rules the literary world along with the phone, internet, TV, all transportation, advertising along with strategists and advisors. As with Venus in this sign, the Leo influence will bring out a creative, passionate and generous nature aspect for this planet. The 10th house is all about the leaders, the mission, the authority and the dedication to the cause. This is where we get to see how this entity will lead and what characteristics that leadership will have. With this placement of Mercury, we’re going to find that communication is a major trait for the leaders. The sign placement shows that they will most likely be willing to put on a show in order to get the word out. Expect them to not only use the internet, but to do so in a way that is flamboyant and expressive. Mars in Virgo in the 10th house. Mars shows where their drive is. This is the masculine energy that deals with confrontation and opposition. It is the warrior, the fighter, the policeman that are all there to settle disputes, conflicts or whatever is under fire. The traits will come from a space that is loyal, analytical, practical and hard working. Virgo dislikes rudeness or asking for help or seeing things dirty. They will get the job done the way that they want it done because no one else can do it the way that they can and do. It is well organized, yet can become overly critical or stuck on the details that no one else really seems to care about. Seeing Mars here, we have a detailed oriented warrior that leads by doing the work himself. Their probably not going to ask anyone to help, but not turn that down if it’s offered, yet that’s offered will probably not be good enough, so they will have to rework it to get what they really need. Mars Mercury Conjunction. Separated by 2 degrees, I would expect that these two energies should combine into a warrior that is effective at communicating. The Virgo influence from Mars will bring in the details or give the leaders the ability to be analytical while giving them the ability to communicate their ideas. Would want to watch for situations when Mercury goes retrograde, or times when Mars is agitated, so that things don’t get said that are regretted at some later date. Sun in Virgo in the 10th house. The Sun represents the leaders of the entity. As we’re seen with Mars, they will be analytical and detail oriented. Being in the 10th house is a natural position for the Sun which shows that the leaders are committed to the project and are willing to do the work to make it happen. They have the details in mind and they will probably do it all by themselves. 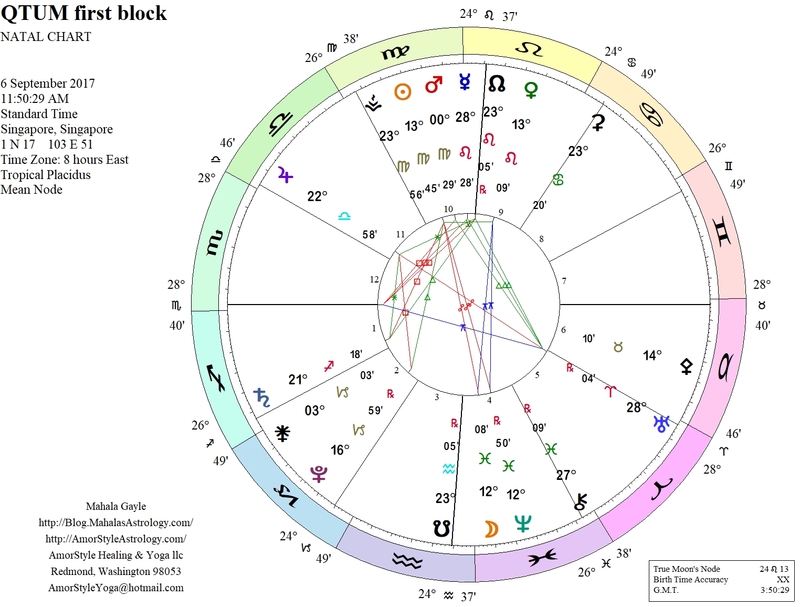 Chart ruler Jupiter in Libra in the 11th house. Libra is an air sign that is once again diplomatic and gracious, but also cooperative and fair-minded. Libra likes sharing with others, yet can be indecisive or carry a grudge. Libra energy shows that there is the need for partnerships for they hate being alone. Jupiter, being the planet of abundance and wealth also brings in qualities associated with religious and judicial organizations, it also deals with banks and bankers. Being in the 11th house shows that this entity will, or has it’s hopes and dreams set on being the bank or replacing the banks or being the next banker or being in a position to function like a bank. This entity desires to take on higher roles with regards to fair-minded banking. Keep in mind that this is also the chart ruler so, at the root of it, there is a larger than life hope or dream to be a just and balanced banking system that will live beyond the lives of the original founders. Where are its talents and strengths? Sun Trine Pluto. There is good energy in the Pluto Sun aspect that will probably embolden the leaders of this community because they know the secrets. They know what goes on behind closed doors and they are motivated to change that or profit from it. This aspect may suggest that the leaders are well aware of the value of sinister behavior and that is a motivating factor. Uranus Trine Mars Mercury Conjunction (and MC). We also have the explosive energy of Uranus that is directly linked to the Mars Mercury conjunction. That conjunction is all about aggressively telling others about the project and that communication will be supported by the technical innovations that Uranus brings to the table. Uranus is in the 5th house, so gambling and taking risks are in play here, but it looks like it’s tempered with both Virgo and Leo energy which will make it so they can show off the details. Uranus is also trine the Midheaven showing that scientific breakthroughs are at the heart to what they do – that is their work. It’s not so much about building partnerships or destroying their competitors, but rather showcasing innovation and making that work for them. Jupiter sextile N. Node and Medheaven and Saturn. The desire to replace banks is tied to their destiny in a synergetic way. Likewise, the favorable aspects of Saturn come together to help with this dream. This could suggest that the fundamental ways in which this entity is designed (with specific restrictions and limitations), it serves to specifically support the desired dream. It’s as if the limitations and restrictions where specifically designed in to help them accomplish their goals. Sun Semisextile Venus. Here the leaders are tied, in a good way, to the attributes that Venus brings with regards to its showy, feminine, flashy characteristics. Expect the leaders to exploit this, but not in a way that the people can relate too. Did it come in with karma? Uranus, Neptune and Pluto all retrograde. The outer three planets are all in retrograde which shows that there is some level of immaturity in each case. Expect this entity to push the boundaries in the ways of a rebellious teenager or take risks that are painfully hard to learn. This is highlighted with the Jupiter Uranus opposition that puts a rebellious spirit against a mature balanced rock of a person. This rebellious nature is also in disagreement with the ascendant hinting that we will see some acting out, but it’s not what this project is all about. The retrograde Neptune is going to accentuate the confusion that people will see in this project. Specifically, due to decisions that the leaders make which are in opposition to what the people want. Keep in mind that the people are here to support the leaders. They are in a position to respect authority, yet it’s an emotional one and Neptune will keep them confused. Or, because of the opposition, the leaders may be out of touch with the followers. This is an situation that the leaders should make an effort to not get into. The retrograde Pluto serves to make the entity a little more reserved with regards to how it deals with the subjects of the dark underworld. Those topics will be internalized before they are brought up for discussion. These secrets are valued highly, so expect them to be handled delicately so as to be used to their advantage. What are the ruling influences? Jupiter in 11th house. The dominate idea has to do with wealth and banking. Jupiter is in a balanced location to allow that energy to flow. We’re going to want to watch transits against this planet or against the planets that are aspected to Jupiter for the details as time unfolds. How are key decisions made? Mars Mercury conjunction in 10th house. This conjunction looks to be a powerhouse for this entity. There will definitely be a masculine overtone to the way this entity communicates. It will be forceful and aggressive, yet rooted in the details. They will take advantage of their ability to be theatrical in order to really make their point. The complication is that there is resistance to their ascendant which will either motivate them or make them feel uncomfortable. Could be stage fright. Could be lack of social skills, or it could be having the wrong person as the spokesman. Uranus in 5th house. This directly feeds the communication channel. Expect the communication to come in waves and be explosive when it does and it’s all about the technology. How does it handle situations outside its control? Moon Neptune conjunction opposing Sun and quincunx Venus. To me, this is one of the hardest aspects for this entity. The people that are following along or giving there time here are in opposition to what the leaders are doing. The Moon Neptune conjunction is going to create a very emotional network that will probably feel confused most of the time. What makes this worse is that it’s in disagreement with the activities that are happening between the leaders and the feminine energy that is highlighted through Venus. It’s like, what the leaders want to do is absolutely not what the followers of the network want with regards to how they use the feminine energy to ‘show off’ what they have accomplished. It’s like intentionally agreeing to allow your network to be the payment system for prostitution or something. I would expect that we’ll want to watch anything that comes along to aspect this Moon Neptune conjunction or what aspects the Sun and Venus to show the sensitive times when the people will not be able to understand what the leaders are doing. Pluto in Capricorn in second house. Seeing that Pluto is in the second house, it would seem that this entity may value that which is hidden and strange in unique ways. This is at odds with what their dream is so it will be interesting to see what comes along to agitated this energy. Aspects to Jupiter. This is the chart ruler so aspects here will show key testing points in time. Aspects to the Sun. This is in a hard aspect with the Moon Neptune conjunction. This will outline points in time went the people will not understand what is going on, or when they do. Aspects to Venus. This may be a sensitivity area that will affect the participants in this network. Aspects to Uranus. This is where the rebel lives, we should watch to see what triggers it. As always, the summary is at the top of the article. Let me know if you see things in this chart that I overlooked that would be relevant. I know I skipped the asteroids, but if there is one that really stands out to you, let me know. I think this is worth watching. If you do too, comment with news articles or accomplishments that you notice that this network achieves. Or, if you know of upcoming events that they sponsor, I can run transit chart for that date to see what we can expect. Moon 08° Capricorn 06' 07"
Mercury 09° Aries 52' 53"
Venus 04° Aries 45' 04"
Mars 16° Gemini 00' 29"